Just a reminder: our office will be closed for construction April 4-18 during our remodel. We will be regularly checking our email and social media platforms during this time to make ourselves available to you. Additionally, we will keep our Facebook & Twitter pages updated throughout the process to keep you in the loop. SAVE THE DATE! We will have a Trunk Show and Grand Re-Opening on Wednesday, May 7 from 3:00-7:00 featuring our best-selling CK and Calvin Klein lines of frames. Stop by during this time for your chance to win a pair of non-prescription sunglasses and other fun raffle prizes! We will be giving away TWO PAIRS of sunglasses… one men’s and one women’s! Attention VSP Members: Have you noticed the changes to your vision plan? Ask about your EXTRA $20 to spend on your new pair of glasses. We will be closed on Tuesday, March 18 for an all-staff conference. Don’t forget to “Spring Forward” on Sunday, March 9. 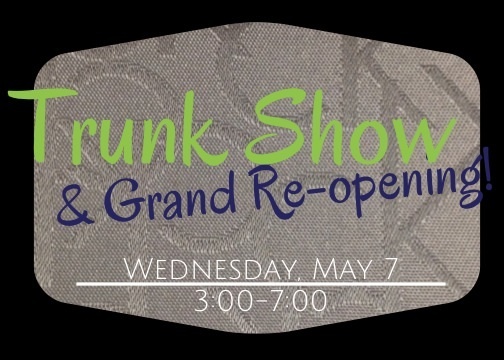 We look forward to seeing you at our Trunk Show and Grand Re-Opening on May 7!